If you are moving soon then please fill in the form below and we will call you back as soon as we can to discuss your requirements. 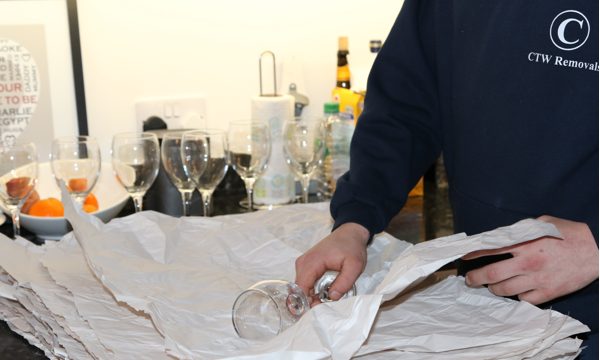 At CTW Removals we pride ourselves on taking the very best care of our clients' belongings throughout the removal process. A large part of keeping your fragile items safe is the way in which they are wrapped and boxed up. We offer a comprehensive packing service using the best protective materials available and carried out by experienced staff. Please do not hesitate to contact us to discuss your specific requirements or to arrange a free, no obligation quotation. We are also able to provide you with extensive packing materials should you so require. Please see the price list below for more details. Having previously used Alan's company in 2014 when the time came to move again I didn't hesitate to email once I had a moving date confirmed. Received speedy and polite reply to email; then on the day it was Alan himself and Callum. They couldn't have been anymore helpful, friendly and considerate. Their level of care and attention is second to none. Absolutely brilliant and should the time come that we move house again, then Alan and co can expect another call from me! Alan and Cameron were punctual, polite and very professional. They arrived on time and were very tidy. We shall certainly use again for other moves. We used Alan and his team when we moved last year, and this year when we moved again. On both occasions they have been absolutely faultless and a pleasure to work with, nothing is too much trouble and everything is done with a smile, despite it being hard graft. No damages whatsoever, stayed until every last bit was done and superb in every way. Thanks Alan and Callum, great work and a real weight off during what is a very stressful time. CTW Removals Ltd has changed a lot since we carried out our first job back in November 2008 as a one man and van service but one thing that has never changed is the high level of customer service that we provide.